Our first #CROchat included plenty of brilliant landing page optimization tips. Image source. Behind every click and form fill, there’s a person waiting to be persuaded. The only way to get these real people to opt in is to deliver a delightful experience with a compelling lead generation landing page. In our recent #CROchat, we asked Oli Gardner and our community members how they appeal to prospects on their lead gen landing pages. Some pretty sharp optimization tips… and some pretty funny memes. If you missed it, not to worry. We’ve rounded up the biggest knowledge bombs that were dropped. Q1: What are the most common mistakes you see people making on their lead generation landing pages? Some other form woes that were mentioned? Q2: What’s the first thing to consider before starting your lead generation landing page design? Next, we asked participants about the first thing they do when they set out to create a lead gen landing page. #CROchat A2: Content and audience go hand-in-hand for design. One informs the next, informs the next. But every answer had a common theme: start with your copy. Q3: How can I tell which content should be gated for lead gen and which to give away “for free”? …while others take into account how advanced the tactics are. Q4: How do you weigh the importance of quality over quantity of leads? Sometimes what’s good for your conversion rate won’t necessarily bring in the highest quality leads. Marketers everywhere struggle to find that happy medium: the secret formula that will bring in hordes of the right kind of customers. What did the #CROchat participants have to say about it? Q5: What would you consider a successful conversion rate? And what’s a positive ROI? 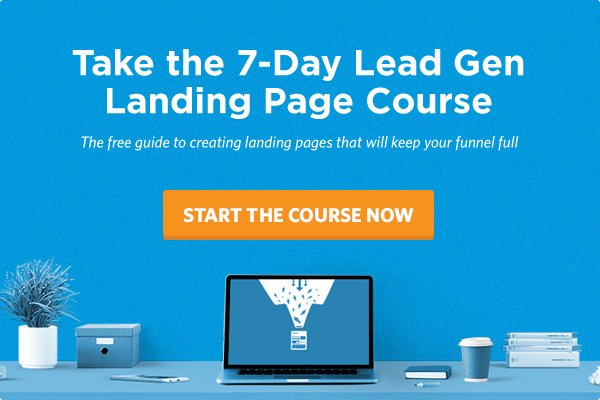 Q6: What are some good things to A/B test on lead gen landing pages? Q7: What are the best alternatives to PPC to drive traffic for lead generation? Everyone would like a little more traffic to their landing pages – but not everyone has the resources or knowhow to set up PPC campaigns. Did you miss the chat and have an awesome tactic to contribute? Share it with us in the comments or on Twitter! And be sure to tune in for our next #CROChat on March 25th at 11:00am PST/2:00pm EST. We’re welcoming special guest Aaron Orendorff of iconiContent to dig into optimizing content for conversion. See you there!